4in wide X 30in max digging depth. THIS TRENCHER ATTACHMENT IS FOR DITCH WITCH SK MODELS. SIMPLY ATTACH TO THE DITCH WITCH SK UNIT AND ATTACH THE HYDRAULIC HOSES. ABC EQUIPMENT RENTAL WILL RENT THIS OUT TO A CUSTOMER THAT HAS HIS OWN MACHINE, OR THE MAJORITY OF THE TIME WE WILL RENT IT OUT WITH ABC'S OWN SK UNITS. 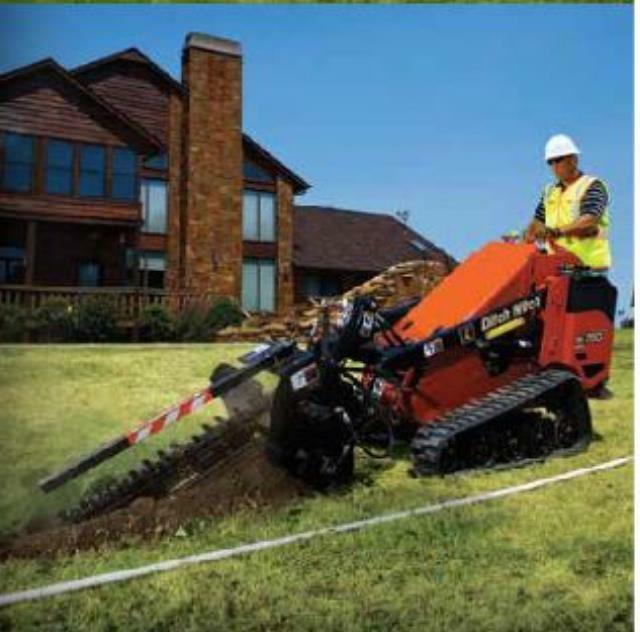 THIS TRENCHER IS SET UP WITH A 30 inch MAX DIGGING DEPTH AND 4 inch WIDE TRENCH. SO IT WILL TRENCH WELL BELOW OKLAHOMA'S FROST LINE. * Please call us with any questions about our trencher attach 4 inch x30 inch sk/dw attachment rentals in Tulsa OK and neighboring communities in Northeastern Oklahoma.